We’re excited to announce the release of a new version of our popular free software, Family Tree Builder (FTB). New version 8.0 has all of the features that you know and love, with a totally rewritten internal infrastructure that adds support for very large family trees (up to 500,000 individuals), and delivers faster performance. Version 8.0 looks very similar to the previously-released version 7.0, but with a brand new engine under the hood. For a period of two years, we have worked hard to build a new framework for the software, designed to provide the best performance and experience for our users, and to support enhancements in the future. It includes all of Family Tree Builder’s beloved features from previous versions such as Sync with MyHeritage, Smart Matches™, Record Matches, the consistency checker, charts, maps, book reports, and more. Version 8.0 is available for Windows, and a Mac Extension version will be provided for Mac users next month. We’ve just completed a successful beta program of version 8.0 with a large pool of test users. Feedback was enthusiastic, and with help from the beta testers, we were able to complete final fine-tuning of the new version. The new version is much faster and more responsive: trees of up to hundreds of thousands of individuals are now supported, and they load very fast. The file format has changed: version 8.0 projects now use an .ftb extension instead of .zed and .uzed used by previous versions. Version 8.0 can load projects produced by earlier versions, and can also import GEDCOM and native genealogy files used by other programs (such as Family Tree Maker®). But note that project files created in version 8.0 cannot be opened by version 7.0 or earlier. When upgrading to version 8.0 from previous versions, Family Tree Builder will maintain a copy of your projects in the former format, just in case. 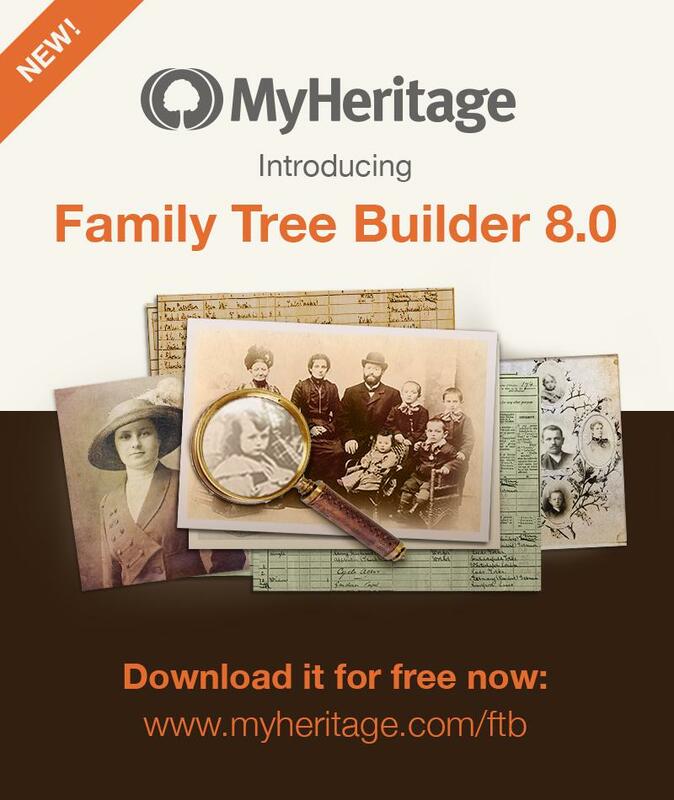 Family Tree Builder 8.0 delivers improved data integrity. This means that changes are now saved immediately and seamlessly upon making them, with no need to click on the “Save” button anymore. The chances of data loss while working on your family tree are now extremely small. Whereas in version 7.0 we loaded the entire database (all the project information) to memory when opening a project, version 8.0 uses a local database and loads to memory only what’s currently necessary and not the entire database. This takes up less memory, making Family Tree Builder faster and more efficient. It also increases the program’s scalability and the total size of the project it can handle is now much bigger. The Family Tree Builder developer team (click to zoom) winning first prize in MyHeritage’s annual costume contest. 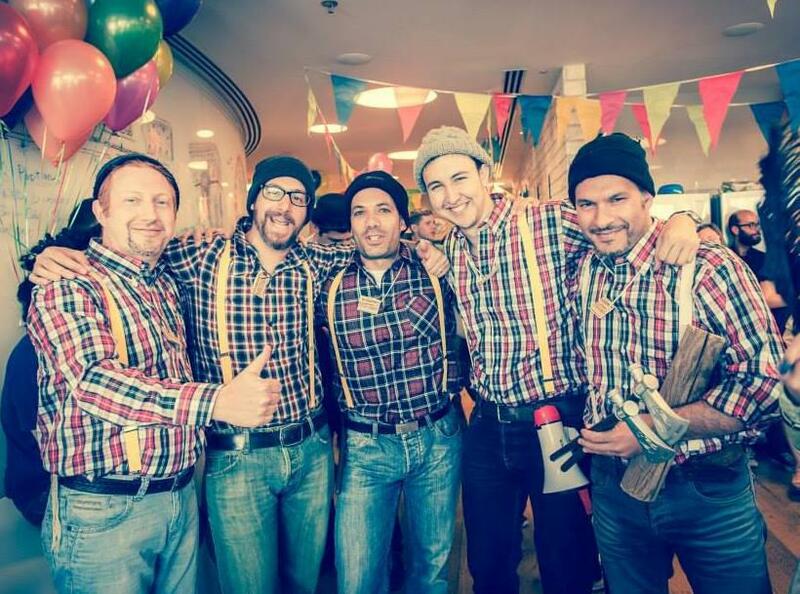 The team dressed up as lumberjacks – a pun reference to their successful project to add logging to Family Tree Builder to improve its performance. Our Family Tree Builder team will continue to enhance Family Tree Builder and evolve it in the future, adding new features and making improvements, based on the new infrastructure introduced in version 8.0. 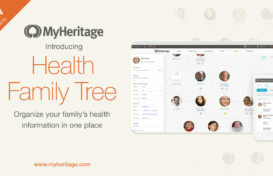 We will continue to provide users who like the power and convenience of desktop software with the ideal tool for growing their family tree and advancing their family history research, while the sync allows them to also benefit from having their data online and accessible in a mobile app. What’s next? In our next release, we plan to add useful features such as undo/redo options, an even quicker sync with online sites, Instant Discoveries™ in Family Tree Builder, and more. 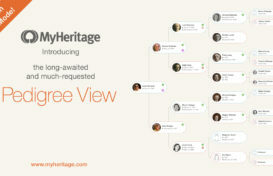 We hope that you’ll enjoy using the new version of Family Tree Builder. Download it today. If you encounter any issues, please tell us and we’ll fix and improve. You are exceptional and wonderful. Through your platform, we realize unifying the families. We admire and support you always. God bless you! Congratulations! It works great and is much faster! Well done! This is great news on the 8.0 I will update from 7.0 to 8.0 as per the information on your site, keep up the great work your team is doing. I have a big family tree, so the changes are great, it is much faster. Seeing all the photos in my family tree completely makes my tree look perfect! I also love filling everybody in on the accomplishments i have had!